San Francisco has been featured on the opera stage as early as Giacomo Puccini’s La Fanciulla del West. That opera, which premiered in 1910, was based on a play by former San Franciscan David Belasco and was set in the California Gold Rush. The Italian libretto includes references to San Francisco and Wells Fargo bank. More recently, Stewart Wallaces’ operas Harvey Milk, which premiered in 1995, and The Bonesetter’s Daughter (based on the Amy Tan novel of the same name), which premiered in 2008, were both set in San Francisco. This Friday, October 23 will see the premiere of the Halloween in the Castro, a new opera with libretto and score by classical and film composer Jack Curtis Dubowsky and performed by the Lesbian/Gay Chorus of San Francisco. In 1946, Ernie DeBaca of Cliff’s Variety Store on Castro Street began organizing Halloween celebrations for the children of the then-predominantly Irish Catholic working-class neighberhood of Eureka Valley – celebrations that came to include costume contests, parades and entertainment. By the time DeBaca discontinued the children’s Halloween celebrations in 1979, the Castro – as that part of Eureka Valley had become known – had transformed into a major residential and commercial center of gay life in San Francisco. Concomitantly, Halloween celebrations on Castro Street had largely turned into a more adult-oriented event for the gay men who then lived in the neighborhood. Dubowsky has commented to me that his opera looks back as far as the period of time when the Sisters of Perpetual Indulgence had taken over responsibility for organizing and managing the Castro Halloween street party – a period that lasted from 1989 to 1994. As reported in the San Francisco Examiner, safety became a growing concern; and the Sisters collaborated with Community United Against Violence and other community organizations in 1995 in the first of many attempts to re-locate the celebration out of the Castro. Such attempts met with mixed results. Ever-increasing crowds from throughout the Bay Area continued to come to the Castro on succeeding Halloweens as various community organizations and city officials took turns in trying to manage it. As Dubowsky notes, and as reported in the San Francisco Chronicle, 2006 saw the pinnacle of Castro Halloween violence when nine people were shot. Subsequent city policy – including a “Home for Halloween” publicity campaign – effectively shut down Halloween in the Castro. Dubowsky has also commented that his research for the opera consisted of reviewing local and national news reports that he was able to find online – including coverage from the San Francisco Chronicle, the San Francisco Bay Guardian, the Bay Area Reporter, the Associated Press, Channel 5 (CBS), and Channel 2 (FOX). Although Dubowsky noted that he has previously donated historical material to the GLBT Historical Society, he also indicated that he did not use the GLBT Historical Society or other Bay Area archival repositories to do his research for the opera. As a professional archivist, this again raises the question for me about what we as archivists can do to make the content of our collections more easily usable to researchers – particularly with regard to content that is not (and may never be) digitized for online presentation. 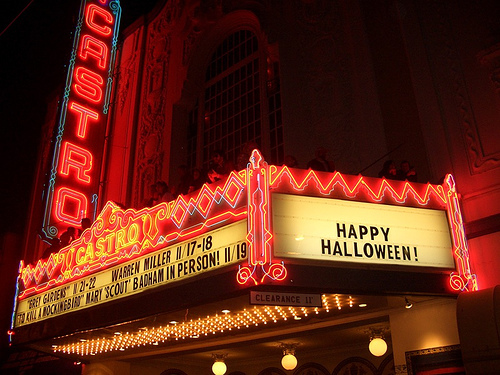 Halloween in the Castro will be presented on October 23, 24, 29, 30 and 31 at 8:00 p.m. at 150 Eureka Street in the Castro in San Francisco. For more information, please call (415) 295-4469 or visit the Lesbian/Gay Chorus of San Francisco website.